Let's start with the designer offerings. Prada leather fringe bracelet, $235 from Yoox. Miu Miu canvas brooch, $129, Yoox. Marni's Lei Effect necklace of green-coloured horn strung on ribbon, £275 from Browns. A closeup viewing on Browns site reveals its translucent artistry. I would wear it to a resort wedding, like the one my friend Kathy attended this month in Tuscany. My advice for any jewelry shopping: first, study the finest, in person if possible. Then shake out your piggy bank and continue your search. You'll make a more considered choice relative to your budget. Of course the danger is falling for the expensive piece, but that Prada leather fringe is TDF. You can find chic choices for under $50. Zebu (a type of cattle) horn square beads necklace, hand-carved by local artisans in Madagascar, from fair-trade merchant The Conscious Consumer, £12.95. 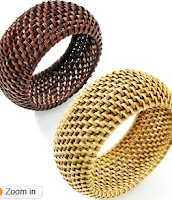 A pai r of two straw "Island Fever" 3/4 inch bangles by RJ Graziano, on sale for $24.43 from HSN, is a steal. Wear as a pair for a tropical accessory with a white shirt or simple dress. from eBay seller 81stgeneration, with a starting bid of £4.99; even with postage this gives heaps of hip for your pennies. 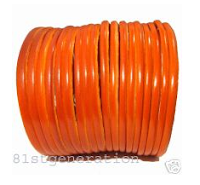 Check 81stgeneration's online store for more accessories like the 58mm (2.28 inch) orange leather wristband, starting bid £7.49. Available in many other colours. 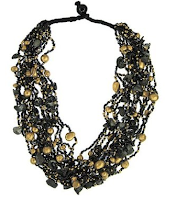 A black and gold wood and shell multi-strand necklace from Target's on line site packs a lot of presence for $17.99. 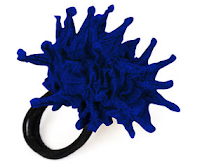 MoMA's Shibori Rings by Bunzaburo Katayama achieve their dramatic sculptural decoration by using the Japanese shibori process to create textural dimension with fabric. Made of polyester, silk, and stainless steel. Available in various colours, $35. Not entirely of 'natural' materials but I couldn't resist showing it! 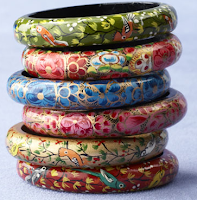 Papier-Mâché Bangles Set: six light, exotic papier-mâché bangles (each 2 5/8" in diameter), painted by hand in India. No two sets will be exactly alike but will be similar in color palette to the set pictured. On sale for $25.49 from the Art Institute of Chicago Museum Shop. woo-hoo! My brother and his girlfriend both work at the Art Institute of Chicago -- maybe I could send them the link as a not-so-subtle hint for my upcoming b-day? Thanks for the inspiration. I'd wear any of those bracelets, even though I find bracelets pretty annoying to wear. Like now. 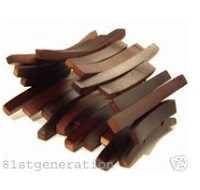 When I'm trying to type with three wooden bangles on! Lovely choices, and I'm especially drooling over that Marni one. I have a large polished carnelian pendant from Devon Leigh, strung on a single leather strand. The simplicity really allows the beauty of the stone to take center stage. Wish I could wear those great bangles, but most are too big and slide right off my hands. I love those straw bracelets, the orange leather one, the Marni necklace -- what fun! Such lovely offerings this morning. Such a treat to peruse especially as you have done all the hard work of finding things. I love things like this for summer especially. Although I like to wear real jewels, I have nothing against the ones made of natural materials. You have managed to find some really nice ones. This kind of jewelry is as its best when it is big, surprising and fun. True, it is something that is safe to take along for travels and you can easily increase your collection while en route. But please be selective! Idem museum shops, though there too some junk and shodilly made gifts can sneak in. I always look forward to your selections. I'm always saying stuff like this, but I'm afraid if I wore that Prada item, it would look (on me) like something one of my kids made. You have to be elegant from top to toe. Now this, rather than clothing, is what people should be looking for at craft shows. There are a lot of artisans making fantastic jewellery comparable to this. And personally, it makes me happy to not only score a great piece, but to support a local artist rather than, say, Miuccia Prada. Other than searches on the now-ubiquitous Etsy, and visiting one's own local shows and sales, the blogger at Another Shade of Grey (http://anothershadeofgrey.blogspot.com/) posts links to many marvellous artists, including makers of jewellery. 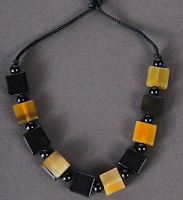 We have just added your latest post "Passage des perles: Casual jewelry of natural materials" to our Shopping Directory . You can check the inclusion of the post here . We are delighted to invite you to submit all your future posts to the directory for getting a huge base of visitors to your website and gaining a valuable backlink to your site.